Item citation: Official records of the Union and Confederate Navies in the War of the Rebellion.. Series I, Volume 7. Washington : G.P.O., 1898. C970.75 U58no Ser. I, Vol. 7. North Carolina Collection, Wilson Library, University of North Carolina at Chapel Hill. 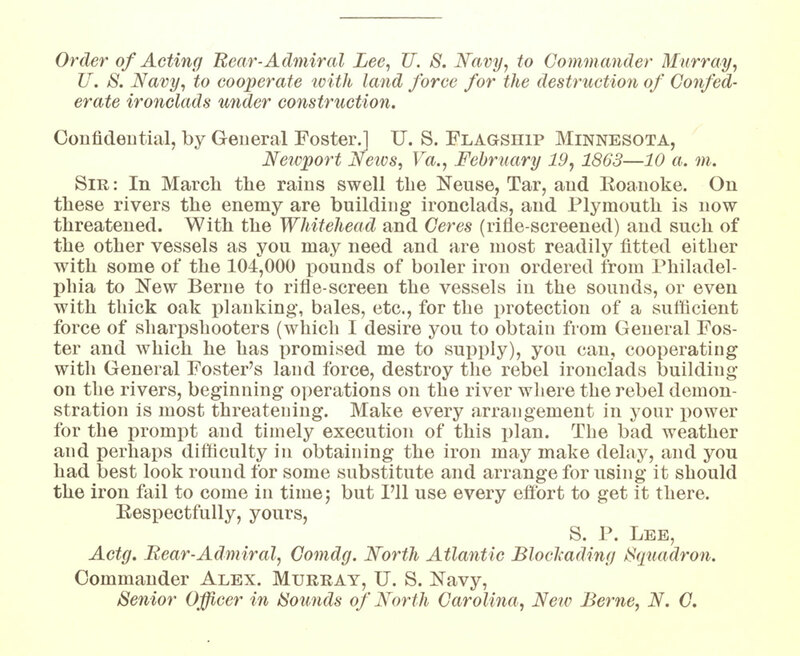 This entry was posted in North Carolina Collection and tagged Alexander Murray, Confederate Navy, ironclads, naval, naval operations, Neuse River, New Bern, Newport News, North Carolina, Plymouth (N.C.), Roanoke River, S.P. Lee, sounds, Tar River, U.S.S. Minnesota, United States Navy, Virginia. Bookmark the permalink.